UNHCR staff in western Ethiopia help move a wounded South Sudanese refugee, who fled across the Baro River to escape the violence. Waves of South Sudanese women and children are fleeing across the Ethiopian border, with more than 11,000 people crossing in the past 72 hours, the United Nations refugee agency today said confirming that UN agencies and humanitarian partners are rushing food and medical supplies to the site. The sharp influx comes after Government forces captured the rebel stronghold of Nasir over the weekend crossing the Raro River, which marks the border between the countries. UNHCR and its partners, including the Administration for Refugee and Returnee Affairs (ARRA) and the Ethiopian Red Cross Society, UN World Food Programme (WFP), were all rapidly scaling up their responses to meet the surge in new arrivals – some of them wounded and in urgent need of medical help – and to improve the crowded conditions, Mr. Edwards said. Once registered, the people were being moved to Kule refugee camp further inside Ethiopia which was “fast approaching its capacity of 40,000 refugees”, while a new camp was being set up for another 30,000 people. The UN agency is hurrying to transport people due to oncoming heavy rains “expected any time”, he added. More than 110,000 refugees from South Sudan had fled into Ethiopia since fighting for political power there broke out in December, according to UNHCR figures. An additional 205,000 people had fled to Uganda, Sudan and Kenya, with some 923,000 people displaced inside South Sudan. Secretary-General Ban Ki-moon is in South Sudan today urging President Salva Kiir and his rival Riek Machar to sit down together and find a peaceful solution through dialogue. The inter-agency appeal for the South Sudanese Refugee Emergency remained dramatically underfunded, with only 14 per cent of the requested $370 million appeal received. “As the number of displaced people continued to rise, UNHCR was expecting to increase its appeal in the coming days,” the spokesperson said. Meanwhile, WFP is warning that without access to everyone in need, the humanitarian situation inside South Sudan is going to worsen. The UN agency is airlifting and airdropping food and nutrition support to hard-to-reach areas, while grabbling with looting and continued fighting, according to spokesperson Elisabeth Byrs. 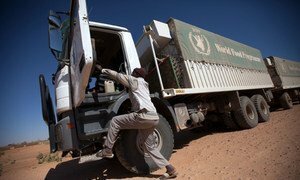 Despite these challenges, WFP has dispatched more than 72,000 metric tons of food around the country so far this year. United Nations agencies are calling on the parties to the conflict in South Sudan to provide safe access to enable humanitarian assistance to reach vulnerable people, including 125,000 Sudanese refugees in Maban County, in Upper Nile state.